Our Philosophy is based on self respect. Self respect comes from a feeling of accomplishment and potential. We believe that you can't respect others until you respect yourself. With these ideas in mind, we train in an atmosphere of respect for ourselves and others. We don't use the word can't. Instead, we say, "I haven't learned that yet". 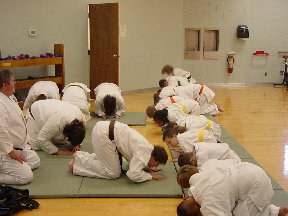 We push students to do more and better so that they can reach more of their potential in the dojo and in life. The students bow to one another at a promotion ceremony on 5/6/2005. 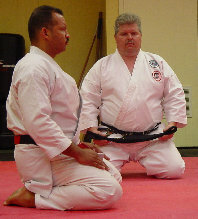 At Jicho`oshin Dojo, we strive to bring out the best in ourselves, and in others. We strive to learn and master virtues that we can then apply to the world around us, and thus bring about positive change within our communities.